It’s important to be aware of the regulations surrounding Pool Fencing in WA and your responsibilities as a homeowner to avoid tragic accidents or hefty fines. Over the last five years, a devastating total of 16 toddlers have drowned in Western Australia, making it the most common cause of preventable death for children aged 0-5. Drownings occur mostly in domestic swimming pools with 94% of incidents at locations in and around the home. In most cases, drownings occur when there is no protective barrier between the house and the pool area, or because the existing barrier is unreliable. 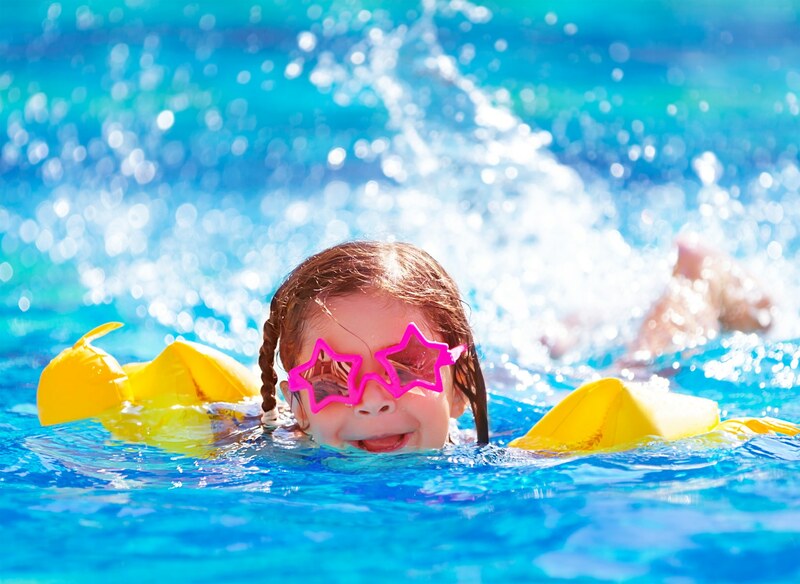 Since 1991, strict regulations have been put into place to restrict unsupervised access by young children to private swimming pools and spas in the determination to protect the safety of children. It is up to the owners and occupants of homes to ensure their fencing or restricting barrier to the pool area is maintained and operating effectively. Not only will the lives of young ones be at risk if you don’t comply with the regulations, but you will also face extensive fines. When Do I Need to Install Pool Fencing at Home? For swimming and spa pools over 300mm deep, and for pools installed after July 1, 1992, a fence is required between the house and pool area. Prior to the construction of swimming and spa pools or installation and alteration of pool barriers, including windows, gates and doors that provide access to the area, a building permit is first required. It is vital that once a building permit is granted, your pool is fenced prior to being filled with water, more than 300mm deep to abide these safety regulations. Does My Above Ground Pool Need a Fence? Yes, compliant safety barriers are required for in-ground, above-ground, and indoor swimming and spa pools. Spa pools can also include Jacuzzis and outdoor hot tubs, however doesn’t include spa baths that are normally emptied after each use. Portable wading pools, providing they don’t contain more than 300mm of water, do not require a child safety barrier but it’s still urged that parents and careers are aware of the dangers these types of pool can inflict. Do Climbable Objects and Trees Have an Effect on My Fencing? Young children are amazing at climbing and quick at it too, so climbable objects such as trees, BBQ’s, pool filters, garden retaining walls or furniture, water features and shrubs can all provide a base for children to climb onto. When measured from the top of the fence on the side closest to the house, objects that can create this foothold must not be within 1.2m of the barrier. These climbable platforms will need to be removed or relocated to be at least 1.2m away from the fence. What Height Does My Pool Fence Have to Be? 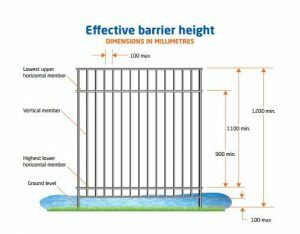 The height of your fence is measured on the side closest to the house and needs to be a minimum of 1200mm, with a clear distance of 900mm between horizontal surfaces. What Materials Should I Used to Construct My Pool Fence? Durable materials that satisfy the strength requirements of the Australian Standard, and that are not climbable should be used. Steel, aluminium, timber, glass, fibre cement and a combination of the above are all suitable materials. The professionals at Fencemakers can advise you on the most cost effective, rust-proof and durable materials to use for Pool Fencing, which will ensure the pool fences passes all relevant legislation, looks great and lasts the test of time. What about Gates and Fittings? Because children can use their weight to push a gate forward, pool gates needs to be hung so they swing away from the swimming pool or spa area. Factors like the gate clearance, gate hinges, latch fittings and release mechanism, and the use of automatic self-closing devices are all part of the Australian Standard and Regulations that our pool gates comply with. 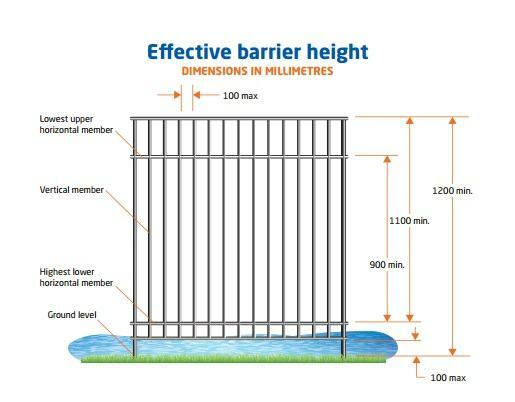 Horizontal Fence Spacing: The gap between vertical slats must not be greater than 10mm. They should be checked according to the regulations to ensure they aren’t capable of being used to aid climbing. Ground Clearance: Just as easy as it is for young children to climb over things, access under fences is also a concern. It is crucial the space under the pool barrier or fence is less than 100mm from the finished and stabilised ground surface. Fencemakers guarantee’s that all Pool Gates and Fencing we install will be compliant with WA Pool Fencing Regulations, as well as adding a stylish finishing touch to your garden pool area. Contact us today for a free Pool Fencing quote.